Interfaces in the topology changed (my previous setup using 3640 does not support MPLS; here 3275 routers are used). Also, for the purposes of MPLS, R4 is connected using sub-interfaces to R1 and R2. Use Initial configuration (Task 1) from the lab 89. Ensure 172.16.105.0/24 (R5) can reach 172.16.102.0/24 (R2). Use MPLS to accomplish the goal. Ensure 172.16.105.0/24 (R5) can reach 172s.16.102.0/24 (R2). Use MPLS to accomplish the goal. Since this mini-lab is a bit more complex than the previous ones, step-by-step procedure is shown below. Just so I can get back to it at a later stage when I begin to forget some details. Loopback interfaces have been advertised into OSPF. 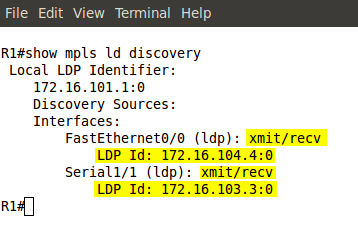 They will be used by LDP protocol to establish session TCP session (DPort=646). It is recommended to use the same router ID when implementing BGP, OSPF, LDP, so I use manual settings. IP CEF is enabled on all interfaces (it is a pre-requisite). Pic. 2 - LDP-enabled Interfaces on R1. R4 has two loopbacks. The higher IP address becomes LDP ID. Since I did not advertised loopback1, I need to force R4 to use loopback0 address as its ID. Pic. 3 - R1's LDP Neighbors. Pic. 4 - R1's LDP Neighbor Discovery. Pic. 5 - R3's LFIB. Pic. 6 - R4's LFIB. The Loopbacks shown (pic. 6 and pic. 7) become the next-hop attributes for MP-BGP session in my configuration. Pic. 7 - BGP Neighbors. Pic. 8 - MP-IBGP Session. Once you activate VRF on an interface, the IP address is removed and must be manually re-created. Pic. 9 - Reachability Check Using VRF. Pic. 10 - BGP Neighbor and VRF Table on R3. Pic. 11 - VRF Table on R4. The same verification as per R3. Pic. 12 - Ping Test. Ensure 172.16.105.0/24 (R5) can reach 172.16.102.0/24 (R2). Use GRE tunnel to accomplish the goal. OSPF does not have to be enabled on Tunnel interface. I did it for practice purpose only! Pic. 2 - GRE Tunnel. Pic. 3 - BGP Session Over Tunnel0. Pic. 4 - Tunnel Interface OSPF-Enabled. Pic. 5 - 0SPF Adjacency Between R3 and R4. Pic. 7 - BGP Table on R4. Pic. 8 - Ping Test. Router R1 is NOT running BGP in AS 134. 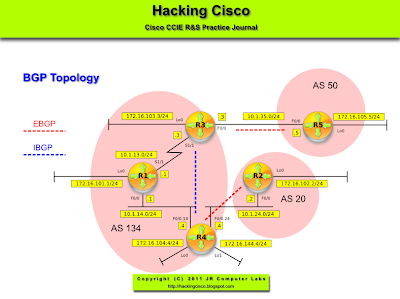 Routers R1, R3, and R4 should run OSPF area 0. Do NOT advertise loopbacks of these routers into OSPF. 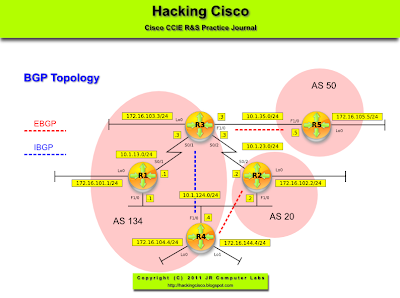 Configure BGP and OSPF as per topology diagram. Ensure 172.16.105.0/24 (R5) can reach 172.16.102.0/24 (R2). Use IGP redistribution to accomplish the goal. Pic. 2 - R2's BGP Table. Pic. 3 - Ping Fails. Pic. 4 - R5's BGP Table. R1 is NOT running BGP. It creates a 'black hole' between 172.16.102.0/24 and 172.16.105.0/24. Since it is not running BGP in never receives the two subnets in question. Packets traversing R1 are being dropped. The 'synchronization' rule was supposed to protect system from such situations. Now, the synchronization is turned off by default! Pic. 5 - R1's Routing Table. If the prefixes have been learned using EBGP peer the redistribution from BGP into IGP works by default. Caution must be taken when using this solution since it is prone to create routing loops. 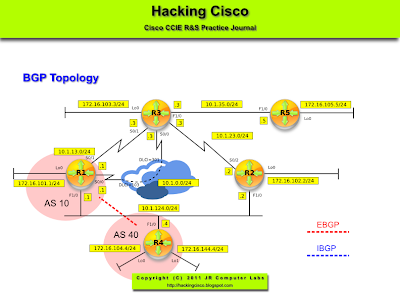 Configure EBGP session between R1 and R4. R4 should advertise an aggregate 172.16.0.0 instead of individual subnets. Do not use 'aggregate-address' command to accomplish this. BGP 'auto-summary' command allows to use a classful 'network' statement (contrary to the situation when auto-summary is disabled). Also, when redistributing subnets into BGP, auto-summary is going to install and advertise them as classful networks. 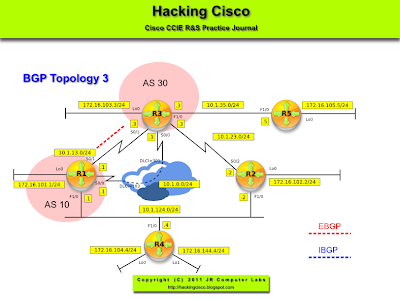 Configure BGP authentication between R1 and R3. Use the password Cisco13. 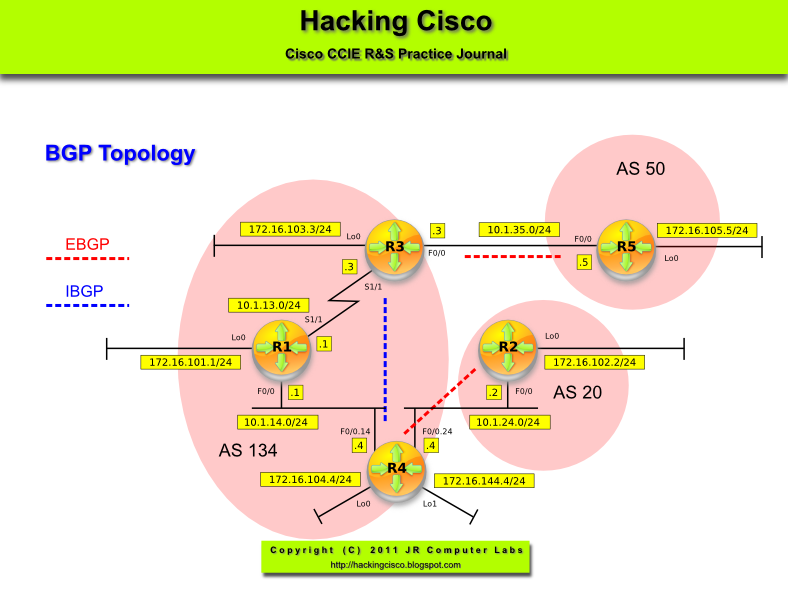 Configure BGP authentication between R1 and R3. Use password Cisco13. BGP supports MD5 authentication only. Pic. 2 - BGP Authentication. Configure EBGP between R1 and R3 in such a way that it can survive either Frame-Relay or HDLC link failure. Do not use ebgp-multihop command. This option (disable-connected-check) does not increment TTL but relies on the fact that the routers ARE directly connected only peering between loopbacks is used. 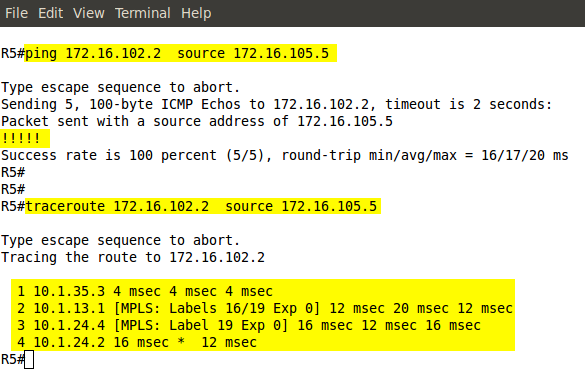 The difference between this and ebgp-multihop is that in the latter one we can tune TTL value allowing multiple transit routers between the two BGP peers. In the former option (disable-connected-check), the routers must be directly connected (1 hop since TTL=1). Pic. 2 - Neighbor Details. Consider the topology (pic. 1). Assume there are three paths between R1 and R3 in the routing table via S0/0, S0/1 and F1/0. Both S0/0 and S0/1 are down. The remaining path from R1 to R3 loopback is via F1/0 (R2 is the next-hop). 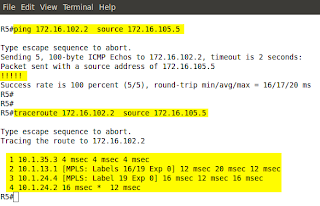 If I use the command: neighbor disable-connected-check, the BGP session is going to time out after 180 seconds (neighbor down). If I use the command: neighbor ebgp-multihop 2, the BGP session is going to survive. Configure EBGP between R1 and R3 in such a way that it can survive either Frame-Relay or HDLC link failure. When EBGP sessions are configured it is assumed that the EBGP peer is directly connected. The TTL is automatically set to 1. This way, session between loopback would not work. EBGP-multihop command changes the TTL (here: 2 hops) allowing session to be established. Pic. 2 - BGP Session Established. Pic. 3 - Neighbor Details. 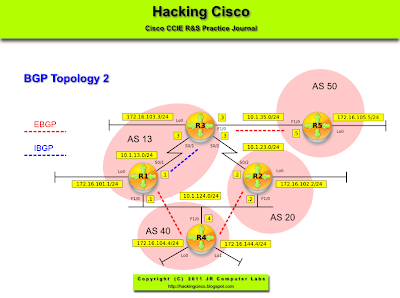 Configure BGP on all routers according to the topology diagram. Advertise all loopbacks using 'network' statement. Check the next-hop behavior on LAN link connecting R1, R2 and R4. Pic. 2 - R5' BGP Table. Pic. 3 - R1's BGP Prefix from AS 20. 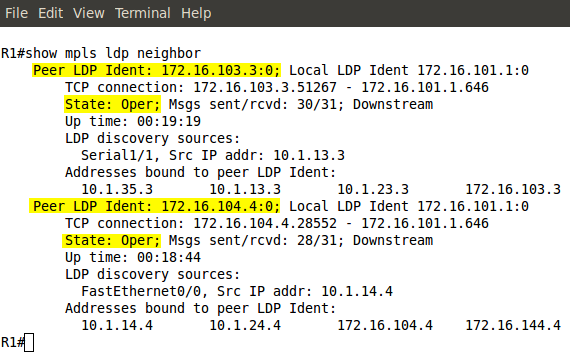 Even though R1 receives the prefix over EBGP session the next-hop address is R2's address rather than R4's. This is the default behavior on Broadcast and NBMA networks. Pay a special attention to NBMA since the circuits may not be fully meshed and the reachability to the next-hop address may be a problem. Pic. 4 - Prefix Details. Use Lab 82 configuration to complete this lab. Enable BGP Synchronization on R1. Ensure R1 can reach 172.16.105.0/24. Synchronization is disabled by default in Cisco IOS Software Release 12.2(8)T and later. The code for the best path '>' has been removed since the prefix is not synchronized with with IGP (IBGP loop prevention mechanism). It takes about a minute to see the change in the BGP table. The result: no reachability to 172.16.105.0/24 (prefix will not be installed in the routing table). Pic. 3 - Prefix Details. Pic. 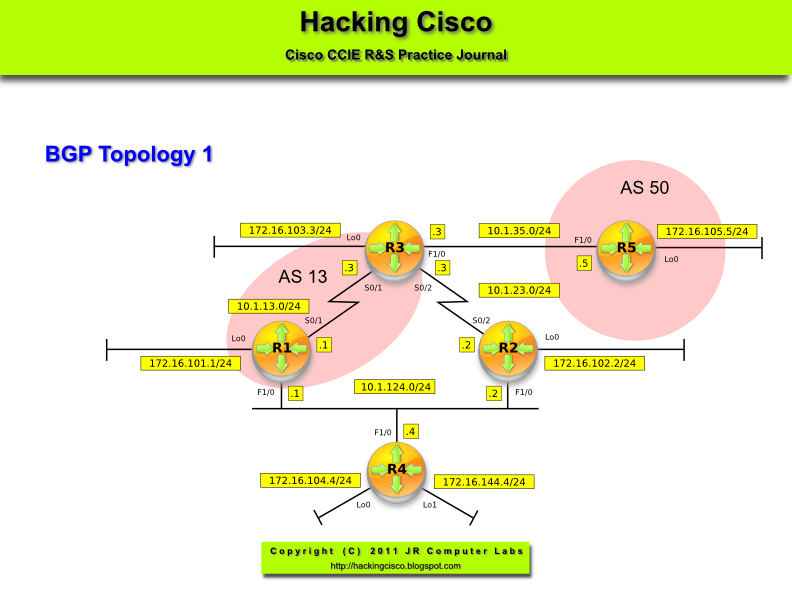 4 - R1's OSPF Routing Table. Pic. 6 - Reachability's Restored. Use Lab 81 configuration to complete this lab. 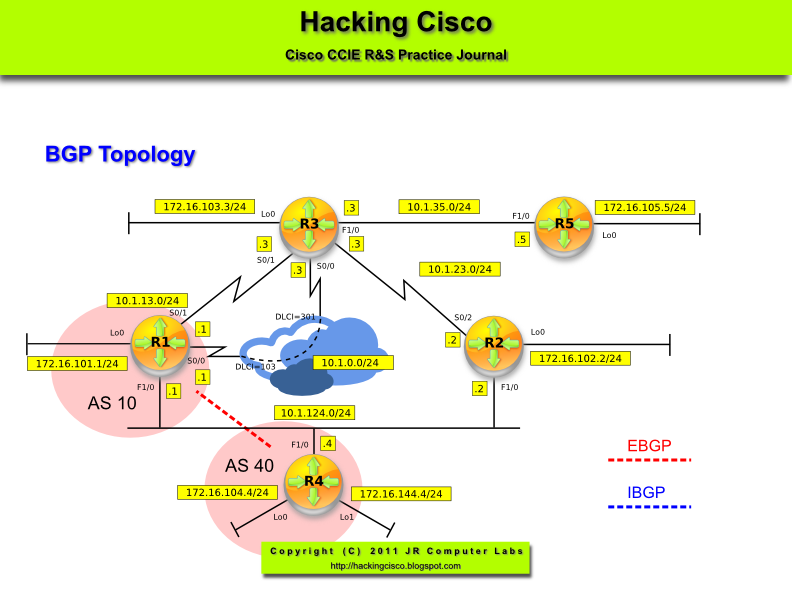 Configure EBGP session between R3 and R5. 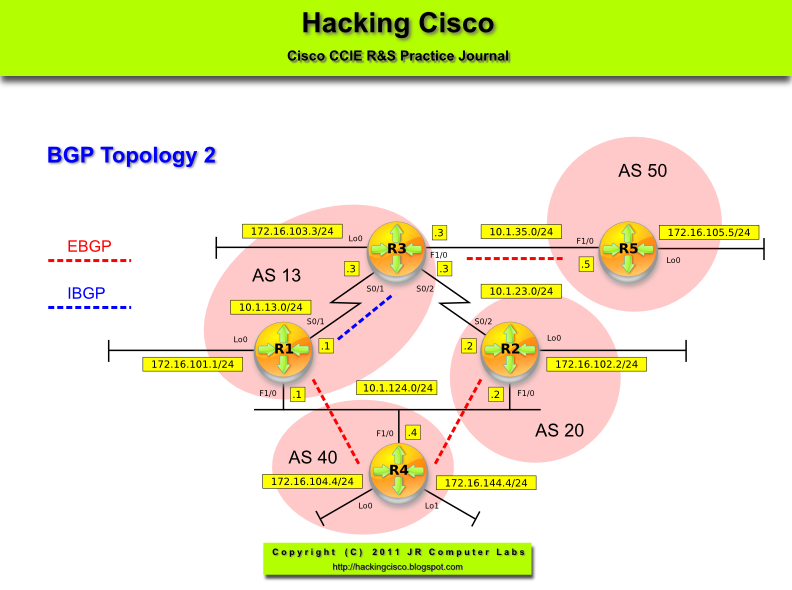 Advertise loopback addresses into BGP on R1, R3 and R5. On R5 do not use the 'network' statement. Ensure the reachability between the advertised subnets. Pic. 2 - EBGP Session between R3 and R5. 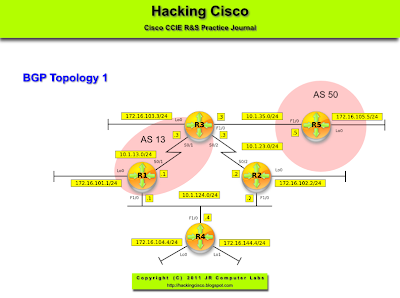 Advertise loopback addresses into BGP on R1, R3 and R5. On R5 don not use 'network' statement. Ensure the reachability between the advertised subnets. 'Network' statement in BGP does advertise the networks (unlike in IGP protocols). The network/subnet must have the EXACT match in the routing table (network/network_mask). If the subnet is being advertised (not a major class), the 'mask' keyword must be used. Pic. 4 - R1's BGP Table. In addition to this, if the 'network' statement is used to advertise a network/subnet, origin code is set to 'i' = IGP. Pic. 5 - R3 Receives the Prefix. R3 receives 172.16.101.0/24 but is marked as RIB-Failure. This is due to the fact that Administrative Distance of IBGP is 200, and the same prefix is advertised by OSPF with the Administrative Distance 110. Next-hop attribute point to the source of BGP advertisements (R1's Loopback0): 172.16.101.1. Pic. 6 - R1's BGP Prefix Details. R3 advertising the prefix to an EBGP neighbor, prepends the AS (13). Pic. 8 - Prefix Redistributed into BGP on R5. The origin attribute for BGP redistributed prefixes is set to '?' = incomplete. R1 is going to have problem with the reachability to 172.16.105.0/24. 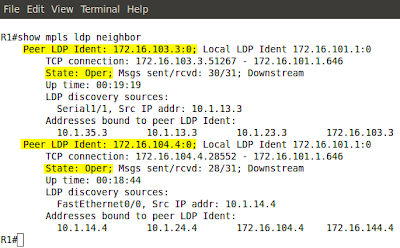 The next-hop attribute set by EBGP peer (BGP neighbor) is not changed (except for connections in the same broadcast domain). R1 has no reachability to the next-hop 10.1.35.5. Pic. 9 - R1's Next-Hop Inaccessible. Pic. 10 - Detailed Output. There's bunch of ways to resolve this issue. For now (some time later more on that), the 'next-hop-self' is going to be used. Pic. 11 - Next-Hop Address Changed. Pic. 12 - Proper Ping Test.